Woolly rhinoceros is the common name for an extinct, plant-eating species of rhinoceros, Coelodonta antiquitatis, that lived in Europe and Asia from about 350,000 years ago until about 10,000 years ago and was characterized by two "horns" (matted hair) on the upper snout and a thick and shaggy coat of hair. With fossils indicating a range throughout Northern Europe and Eastern Asia, from South Korea to Scotland to Spain, the woolly rhinoceros may have had, during the later part of the Pleistocene epoch, the most extensive range of any known living or extinct rhinoceros. The woolly rhinoceros appears in the cave paintings of early humans (Ballenger and Myers 2001). The fact that human beings co-existed with the woolly rhinoceros, and likely hunted them as a food source despite their formidable size and strength, adds to the fascination of these creatures for people today. It is possible that human beings, coupled with climate changes, were factors in the extinction of the woolly rhino, although some areas of habitat appear to have been too cold for early humans to cope with in any substantial populations (Amos 2002). As a member of the rhinoceros family, Rhinocerotidae, the woolly rhinoceros is an odd-toed ungulate and is characterized by large size and projections or "horns" on the upper snout. It was native to the northern steppes of Eurasia, living during the Pleistocene epoch and surviving through the last glacial period. The woolly rhinoceros is a member of the Pleistocene megafauna. The genus name Coelodonta comes from the Greek for "hallow teeth" and the specific name antiquitatis comes from the Latin antiquus for "old" (IRF). Woolly rhinoceros (Coelodonta antiquitatis), skeleton on display. Fossils indicate that the woolly rhinoceros was about 3.0 to 3.8 meters (10 to 12.5 feet) in length, with a height of two meters (six feet) at the shoulder, and a weight of up to three tons (IRF). It had two horns on its snout, the anterior one larger than the one between its eyes and about one meter (three feet) long. The front and larger horn also had a flattened shape from side to side (IRF). Both projections on the upper snout were not really true horns, but epidermal derivatives, composed of a solid mass of thickly matted hair—keratin, a hair protein—that grows from the skull without skeletal support. The woolly rhinoceros had thick, long fur, small ears, short and thick legs, and a stocky body. The fur consisted of two kinds of hair, with both a thin dense undercoat and a long, rigid covering (IRF). Cave paintings suggest a wide dark band between the front and hind legs, but it is not universal in drawings; identification of rhinoceros as woolly rhinoceros is uncertain. Abrasion marks on the horns of woolly rhinoceros fossils suggest that the horns were used to sweep snow away from vegetation so it could eat in the winter. As the last and most derived member of the Pleistocene rhinoceros lineage, the woolly rhinoceros was supremely well adapted to its environment. Stocky limbs and thick woolly pelage made it well suited to the steppe-tundra environment prevalent across the Palearctic ecozone during the Pleistocene glaciations. Its geographical range expanded and contracted with the alternating cold and warm cycles, forcing populations to migrate or perish as the glaciers receded. Like the vast majority of rhinoceroses both living and extinct, the body plan of the woolly rhinoceros adhered to the conservative morphology displayed in the most primitive rhinoceroses, first seen in the late Eocene. A close relative, the giant unicorn (Elasmotherium), a giant rhinoceros with a single two-meter-long horn in the forehead, had a more southern range. 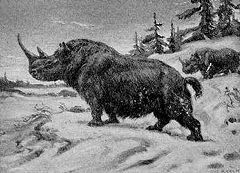 As with extant rhinoceroses, the woolly rhinoceros was a herbivore. Controversy has long surrounded the precise dietary preference of Coelodonta as past investigations have found plausible both grazing (eating grass and other low vegetation) and browsing (eating leaves and woody twigs from trees and shrubs) modes of life. The palaeodiet of the woolly rhinoceros has been reconstructed using several lines of evidence. Climatic reconstructions indicate the preferred environment to have been cold and arid steppe-tundra, with large herbivores forming an important part of the feedback cycle. Pollen analysis shows a prevalence of grasses and sedges within a more complicated vegetation mosaic. A strain vector biomechanical investigation of the skull, mandible and teeth of a well-preserved last cold stage individual recovered from Whitemoor Haye, Staffordshire, revealed musculature and dental characteristics that support a grazing feeding preference. In particular, the enlargement of the temporalis and neck muscles is consistent with that required to resist the large tugging forces generated when taking large mouthfuls of fodder from the ground. The presence of a large diastema supports this theory. Comparisons with extant perissodactyls suggests that Coelodonta was a hindgut fermentor with a single stomach, and as such would have grazed upon cellulose-rich, protein-poor fodder. This method of digestion would have required a large throughput of food and thus links the large mouthful size to the low nutritive content of the chosen grasses and sedges. It is believed that the woolly rhinoceros lived socially similar to modern forms, either alone or in small family groups (IRF). The woolly rhino first appears in the fossil record about 350,000 years ago (IRF). Fossils have been found commonly in Europe and Asia, but not in North America, indicating populations never moved across the Bering Land Bridge (IRF). Fossil findings include some well-preserved remains that are frozen in ice or buried in oil-saturated soils (IRF). At Staruni in what is now the Ukraine, a complete carcass of a female woolly rhinoceros, minus only the fur and hooves, was found buried in the mud, with the oil and salt preventing decomposition and allowing the soft tissues to remain intact (IRF). The specimen is now on display in the Polish Academy of Sciences' Museum of Natural History in Kraków. 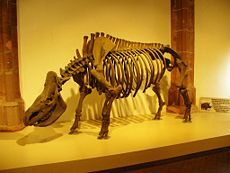 In 2002, fossils of four woolly rhinos were unearthed in an English quarry (Whitemoor Haye, Staffordshire), representing one of the best Ice Age discoveries in Northern Europe, tracing to 30,000 to 50,000 years ago (Amos 2002). Included in this find were well-preserved plants and insects, including plant material stuck to the teeth of one rhino. Coelodonta antiquitatis skeleton displayed in Hong Kong Science Museum. The woolly rhinoceros is depicted on the walls of caves in France, tracing to some 30,000 years ago (IRF). The woolly rhinoceros co-existed with woolly mammoths and several other extinct larger mammals. The woolly rhino roamed much of Northern Europe and was common in the then cold, arid desert that is southern England and the North Sea today. During Greenland Stadial 2 (The Last Glacial Maximum) the North Sea did not exist as sea levels were up to 125 meters lower than today. Radiocarbon chronology (C-14) of woolly mammoths finds in Siberia indicate the final extinction of the woolly rhinoceros in Siberia dates to about 11,000 to 9,700 years before present (Orlova et al. 2004). This gives an extinction date of about 8,000 B.C.E. The accuracy of this date is uncertain as several radiocarbon plateaus exist around this time. The extinction does not coincide with the end of the last ice age but does coincide with a minor, yet severe, climatic reversal that lasted for about 1,000–1,250 years, the Younger Dryas (GS1 - Greenland Stadial 1). The Younger Dryas were characterized by glacial re-advances and severe cooling globally, a brief interlude in the continuing warming subsequent to the termination of the last major ice age (GS2). The woolly rhino was hunted by early humans, who may have contributed to its extinction. A close relative, the Sumatran Rhinoceros (Dicerorhinus sumatrensis), still survives in Southeast Asia, but is highly endangered. Amos, J. 2002. "Extraordinary" woolly rhino finds BBC, October 30, 2002. Retrieved June 30, 2008. Ballenger, L., and P. Myers. 2001. Rhinocerotidae Animal Diversity Web. Retrieved June 29, 2008.
International Rhino Foundation (IRF). n.d. Woolly rhino (Coelodonta antiquitatis) International Rhino Foundation. Retrieved June 30, 2008. Orlova, L. A., Y. V. Kuzmin, and V. N. Dementiev. 2004. A review of the evidence for extinction chronologies for five species of Upper Pleistocene megafauna in Siberia Radiocarbon 46(1): 301-314. Retrieved June 30, 2008. This page was last modified on 3 August 2013, at 21:28.